If you’ve been to Portland you’ll find plenty vegan food and you’ll also likely experience a thing called soy curls. They’re found everywhere from Homegrown Smoker to Native Bowl. 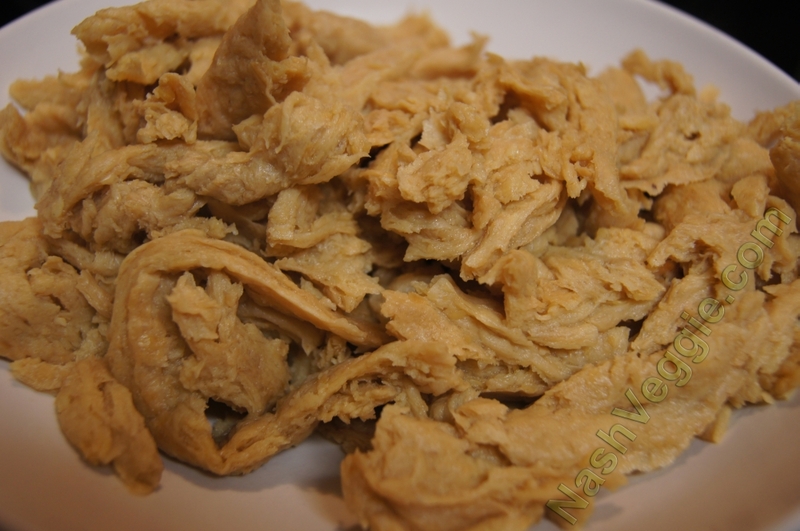 Nothing more than dried soybean protein they have a chewy texture and, like tofu, Butler Soy Curls can take on the flavor properties of whatever you season them with. So when given a few bags of these versatile goodies I brainstormed on what I should prepare first. The obvious choice was a simple barbecue sandwich. I’m no fan of meat substitutes and I’ve made that clear before. I do, however, realize that fake meats have their place for transitioning vegetarians and the occasional vegan who likes the chance of getting with some junk food. I’ll indulge in junk food from time to time and sometimes one of those fake meats might be what I choose if it’s new or really doesn’t have exact properties of actual meat. 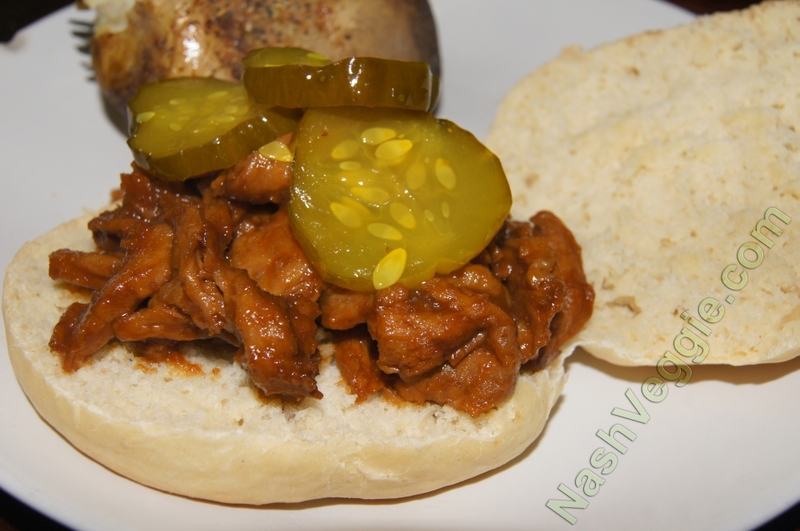 I chose to make saucy barbecue sandwiches using some of the peach BBQ sauce I made and bottled over the summer. Instead of simply soaking the curls for a few minutes as the directions indicated I simmered them in a mixture of broth, seasonings and a little of the peach BBQ sauce for about 15 minutes until most of the liquid had boiled away leaving the soy curls well-flavored before I added them to a saucepan of peach BBQ sauce. I turned them down on low and simmered them again for about 30 minutes. Fresh baked buns awaited great vegan barbecue sandwich. Butler Soy Curls hydrated. At this point they have a slightly chewy texture and are ready for your recipe. 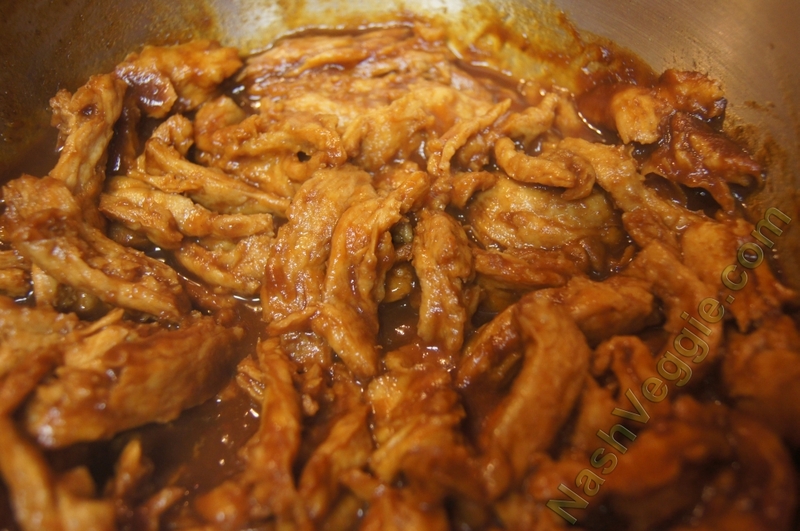 Butler Soy Curls simmering in homemade Peach BBQ Sauce. Getting ready for a great vegan BBQ sandwich. The soy curls are slightly chewy and have no flavor on their own so they can be made to fit into most any dish you choose. They’re great for stir fries, sandwiches, fajitas and could be chopped slightly smaller and used in soups or stews. 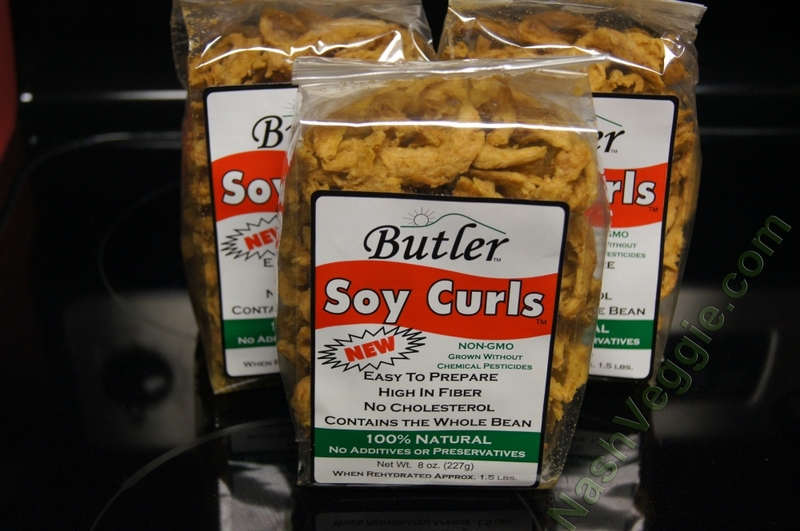 Butler Soy Curls are available from their website as well as many online retailers. Food carts! In Portland they’re everywhere. 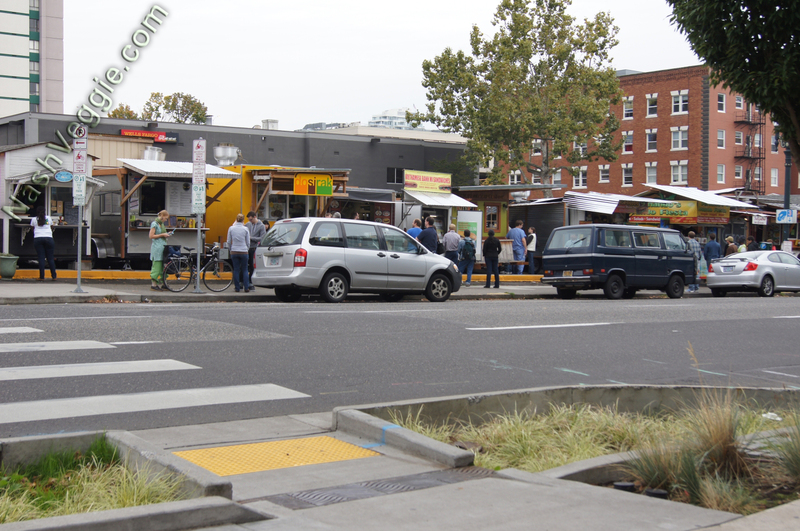 6×12 (or somewhere in that general area) portable trailers fitted with small kitchens and setup in empty lots around the city. You’ll find just about any cuisine you’re in the mood for: Chinese, Vietnamese, Thai, Mexican, burgers, pizza, coffee bars and juice bars and plenty of vegan and vegetarian options. One we searched out and really enjoyed was Homegrown Smoker. 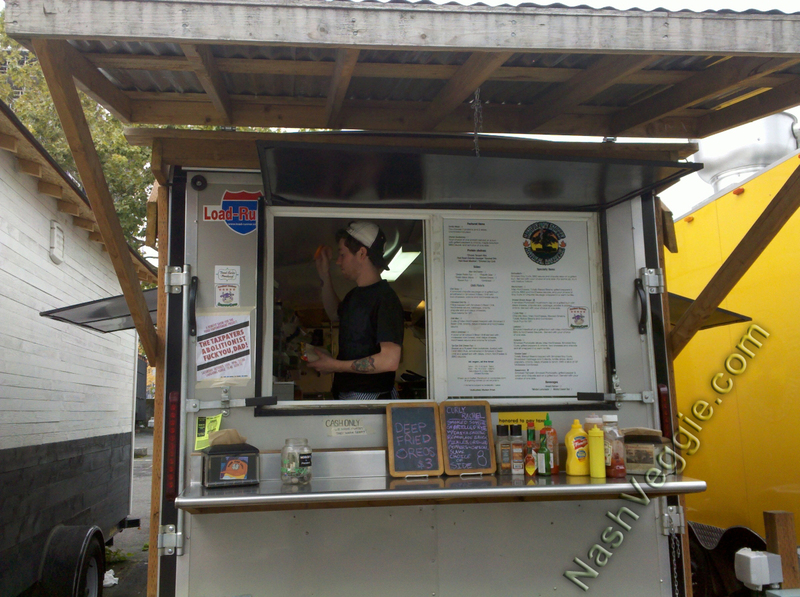 You’ll find Homegrown Smoker in a food cart pod at SW 4th and SW Hall at Portland State University. The menu is completely vegan and filled with barbecued and smoky goodness. It was hard to choose from the menu. So many delicious sounding choices. There’s the SloSmoMoFo: BBQ soy curls which are chunks of seitan in a sweet, smoky barbecue sauce, and chipotle slaw on a grilled bun. A Macnocheeto: vegan mac and cheese, baked beans, grilled peppers and onions, BBQ sauce, vegan cheese sauce and a choice of those soy curls or vegan chipotle sausage wrapped in a tortilla. 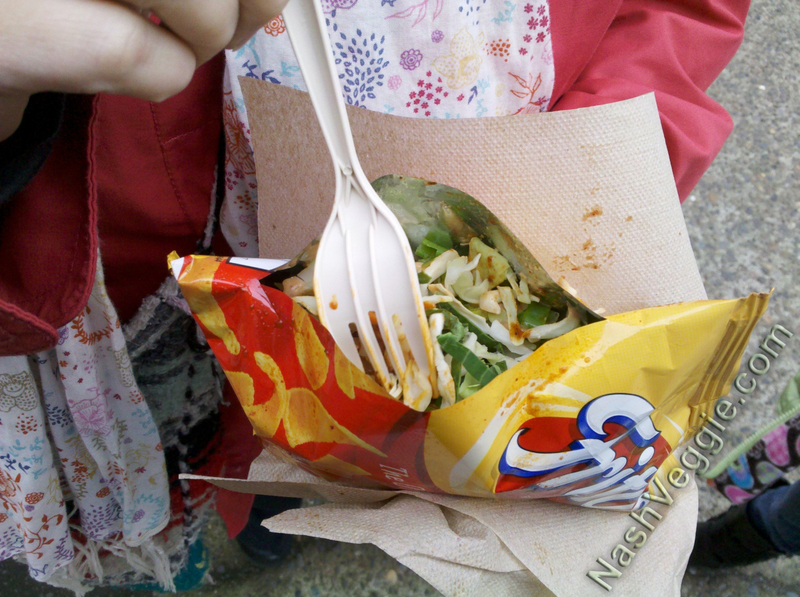 We settled on the Smoked Chili Pie: A bag of Fritos corn chips opened and inside poured smoky chili, cabbage, onions, chipotle aioli, Daiya cheese and the vegan NoCheese sauce. It looks very subdued but that’s one bag of a filling lunch. We also picked the Loafaroni, my favorite of the two. Two thick-cut pieces of smoky vegan meatloaf topped with Mac & NoCheese and covered in BBQ sauce and NoCheese sauce on a grilled bun. That’s right, ON A BUN! It’s a sandwich! 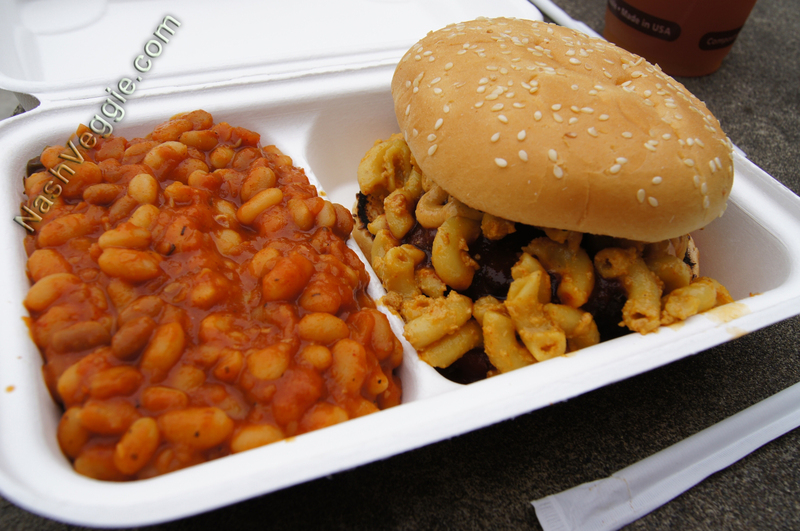 How can you possibly go wrong with vegan mac & cheese on a bun? It’s served with one side so spicy baked beans worked perfectly. Did I mention it is ON A BUN? 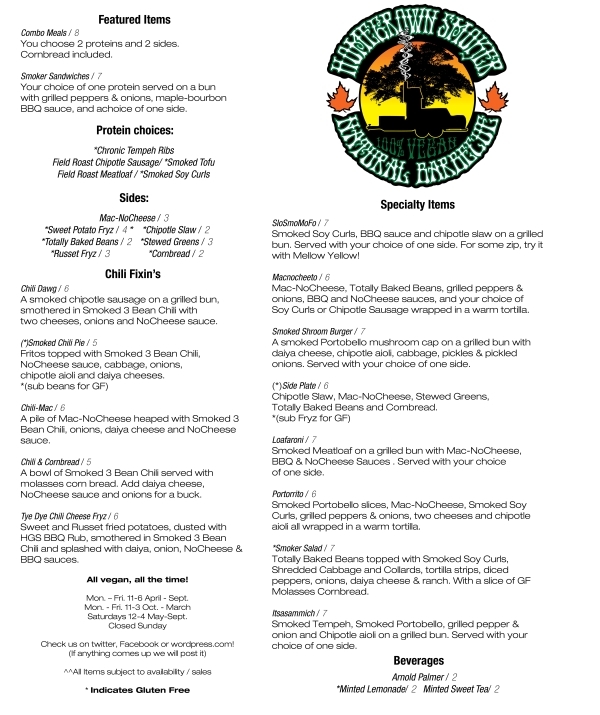 Everything on the menu at Homegrown Smoker is 100% vegan. When you’re faced with so many vegan choices in a city like Portland, Oregon and then most all of them are 100% vegan you have to pick and choose wisely. Choosing Homegrown Smoker won’t be a bad decision. Loafaroni: Smoky Vegan Meatloaf, Vegan Mac & Cheese, BBQ sauce and vegan cheese sauce ON A BUN!